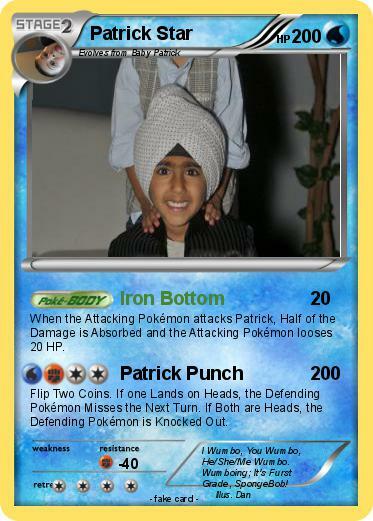 When the Attacking Pokémon attacks Patrick, Half of the Damage is Absorbed and the Attacking Pokémon looses 20 HP. Flip Two Coins. If one Lands on Heads, the Defending Pokémon Misses the Next Turn. If Both are Heads, the Defending Pokémon is Knocked Out. Comments : I Wumbo, You Wumbo, He/She/Me Wumbo. Wumboing; It's Furst Grade, SpongeBob!